"We do not want to attack on Pakistan first. We want to live with peace and harmony with our all neighbours. But most unfortunately Pakistan is trying to tear down Jammu and Kashmir and continue attacks on our forces and Indian territory," Union Home Minister Rajnath Singh said an election rally at Barjala on the state capital's outskirts. 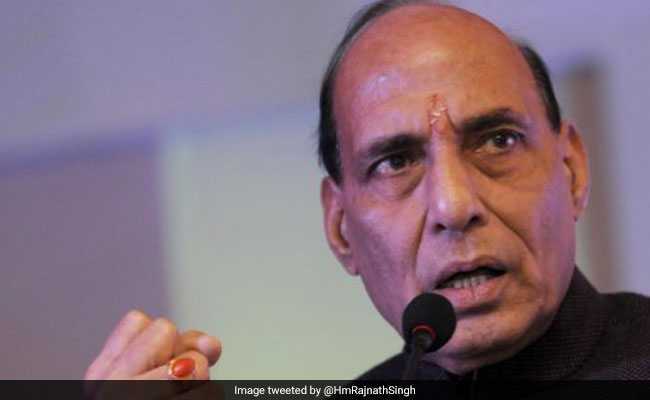 India wanted peaceful relations with Pakistan, but the country's forces have been told that if one bullet comes from across the border, the security personnel should fire countless bullets to retaliate, Union Home Minister Rajnath Singh said in Agartala on Saturday night. "I have given standing orders to our forces to shoot limitless bullets to retaliate a single fire on our territory by the Pakistani forces," he said at an election rally at Barjala on the state capital's outskirts. "We do not want to attack Pakistan first. We want to live with peace and harmony with our all neighbours. But most unfortunately, Pakistan is trying to tear down Jammu and Kashmir and continue attacks on our forces and Indian territory," he added. Hitting out at the Left Front government, Rajnath Singh said that during its 25 years of uninterrupted rule, it did nothing for the development of Tripura, economic prosperity of the state and to remove huge poverty and unemployment. "During CPI-M's 35-year-rule in West Bengal, they ruined that state, and if the Left parties after the February 18 assembly polls are allowed to rule Tripura further, they would destroy the future of the state and its people," he alleged. He said that only his party, the Bharatiya Janata Party (BJP), can develop the country and the northeastern states including Tripura. "BJP and its allies are now ruling 19 states in India. Why so many states are under BJP and its allies' governance? Because people of these states trust BJP and people sincerely believe that only BJP can remove their poverty and provide jobs to the youth." Rajnath Singh said that Tripura has huge natural resources and if BJP comes to power in the state, it would make this northeastern state "number one" state in India.